ROO Casino launched in 2017 with a strong focus on Australian casino players with a great selection of high quality slots and games available on your desktop or mobile device. The casino is very well designed and easy to navigate with everything of importance just one click away from the homepage. On top of this they offer their players great bonuses and promotions along with a lucrative VIP Club for their loyal players. ROO Casino is licensed for online gambling by the Government of Curacao. 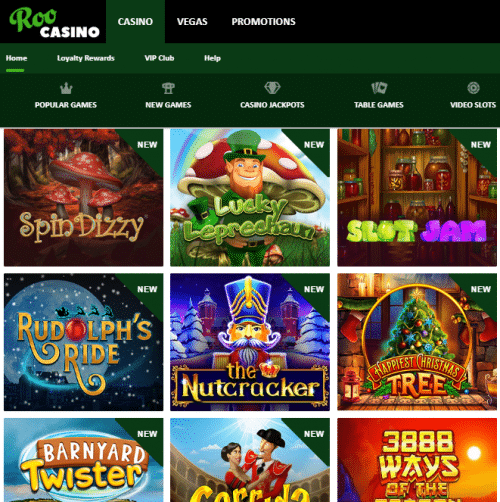 ROO Casino has a great selection of casino games from multiple software providers including BetSoft Gaming, Booming Games, Booongo, iSoftBet, Endorphina, Habanero, Amatic Industries, Ainsworth, Red Rake and Gamomat. All of their games are instant play so download is required to play here. Slots players will find a great selection of games with popular titles like Lucky Leprechaun, Pinocchio, The Slotfather Part II, Rook’s Revenge, Gladiator, Mad Scientist, The Tipsy Tourist, Lucky Clover, Gold Rush and many, many more. They also have 12 progressive jackpot games available that payout increased jackpots randomly at any time with one lucky spin. Table game players will find the classics like Baccarat, Blackjack, Roulette, Caribbean Stud, Three Card Poker, Turbo Poker, Dragon Tiger, Caribbean Hold’em, Sic Bo Poker and Golden Joker Dice. They also have several popular video poker games like American Poker, Joker Poker, Triple Joker and American Poker V. Other more casual games include Bingo, The Boss Lotto, Candy Rush, Keno, Snakes & Ladders along with several Scratch card games. Put ROO Casino in your pocket and play your favorite slots and casino casino games anywhere, anytime you get the urge. All of their games are fully optimized for mobile devices and work flawlessly on any size screen. You can get access to the casino on the majority of internet capable smartphones or tablets. To get started all you need to do is visit the casino on your mobile device and they will seamlessly take care of the rest. First Deposit – Get a 200% Welcome Bonus up to $5000 with a minimum $20 deposit. The Matchmaker – Get a 25% Bonus up to $100 with a minimum deposit of $25 or more every day. Twice as Nice – Get a 10% Bonus up to $50 + 10 Free Spins on Fruit Zen with a minimum deposit of $20 or more every day of the week. Keepn’ it Reel – Get 30 Free Spins on Alkemor’s Tower with a minimum deposit of $25 or more every day. The Nifty Bonus – Claim a 35% Bonus up to $100 with a minimum deposit of $50 or more once every day. ROO Casino provides their players with simple safe and secure banking options to fund your account or withdraw your winnings. All banking options are available on your mobile device. Deposit methods include Visa, MasterCard and Neosurf. Withdrawal methods include Visa and Bank Wire Transfer. Currencies accepted include Australian Dollars(AUD), Canadian Dollars(CAD), US Dollars(USD), Euro(EUR), Norwegian Krone(NOK) and Swedish Krona(SEK). ROO Casino has a dedicated support staff available 24/7 to help you with any questions or problems you may have no matter how big or small. You can contact the the support team via Email or Live Chat. Residents of the following countries are restricted from opening an account at ROO Casino. Aruba, Belgium, Bonaire, Curacao, Czech Republic, Denmark, France, French Territories, Hungary, Ireland, Israel, Italy, Netherlands, Romania, Saba, Serbia, Singapore, Spain, St Martin, Statia, United Kingdom and United States of America. This casino may be strongly focused on the Australian market however they do accept players from many other countries around the world. With the great selection of slots and casino games for desktop or mobile devices ROO Casino is definitely for you. We highly recommend that you take advantage of their great welcome bonus offer today and see for yourself what this great cool casino has to offer.